Discover state-of-the-art anti-aging and skin rejuvenation treatments at Dermaworks, arguably the best medical spa Ottawa has to offer. Feel and look your best by taking advantage of our advanced aesthetic treatments. We provide an array of innovative, effective treatments to keep you looking – and feeling – amazing. Your cosmetic concerns are unique and personal. You deserve a custom-tailored treatment that can produce real-world results. Our cosmetic treatments are the best of the latest developments in aesthetic technology: effective and non-surgical, for truly remarkable results. Experience the best. Experience the spectacular skin rejuvenation possible with modern aesthetics treatments to smooth wrinkles, lines, and folds. We can help you maintain a fresh, youthful look for years longer than ever before possible – without surgery. In a series of injections performed by our physician, the volume of your lips can be improved using any one of a number of products that have been tried and tested for their effectiveness. Aging skin and tissue on your hands can be unattractive and embarrassing. Thankfully, modern aesthetic treatments can restore a youthful look to your hands. Why let your neck reveal your age when modern cosmetic technology can tighten, smooth, and firm your neck skin? At Dermaworks in Ottawa, we can help you look as young, vital and fresh as you feel inside. It’s a beautiful thing. Imagine smoothing the unsightly dimples of cellulite – and the freedom to reveal more of your body with confidence. Our custom cellulite-smoothing treatment with Sculptra creates a remarkable improvement by triggering collagen production – nature’s most perfect firming agent. If you suffer from hyperhidrosis, you deserve relief from the stress and embarrassment the condition brings. Our advanced non-surgical treatment for excessive sweating can be life-changing. We take injectables seriously. Achieve your unique aesthetic vision by smoothing wrinkles and folds, adding volume to create balanced facial definition, or experience a lift without surgery – it is all possible here at Dermaworks, our excellent medical spa in Ottawa. To create subtle, natural-looking enhancement demands high level skills and an artistic use of injectables. We listen, we understand, and we work closely with you to create the look that brings joy and confidence to your life. Your face is your calling card, noticed by every person you encounter – why not take advantage of the modern aesthetic science to rejuvenate and refresh your look? When your facial skin appears healthy, firm, and youthful, you will feel empowered and confident no matter where life’s journey takes you. You want to feel comfortable and confident in the skin you’re in – free from unwanted hair or excessive perspiration. We provide advanced laser hair removal treatments to help you have smooth, hair-free skin on face, arms, back, legs, or bikini zone. No more shaving, waxing, or plucking, just smooth lovely skin. If you are one of the many people who suffers from excessive perspiration, you can finally be free from anxiety and embarrassment with our state-of-the-art hyperhidrosis treatment. It’s a whole new world, and it belongs to you. 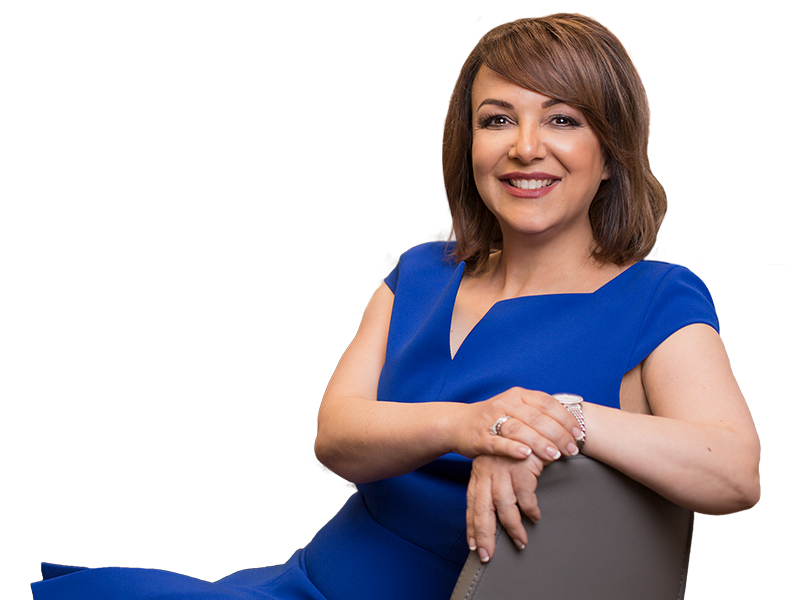 Dr. Demetra Vassiliou brings extensive medical knowledge and experience to Dermaworks Medical Aesthetics Clinic, our medical clinic in Ottawa. During her illustrious medical career, she reached her 40s – and took the step to undergo aesthetic treatments herself. The results spurred a deep interest in what modern medicine can achieve. She has continued to stay ahead of the curve in the latest advancements in aesthetic technology to benefit of her patients – who trust her skill, judgment, and artistry to create extraordinary results. You deserve the time and attention of your doctor – and with Dr. Vassiliou, you will never be just another patient – you are an individual with questions, concerns, and a vision and voice you want to express. We listen, we care, and you will never be rushed. We work with you to help you achieve the enhancement that brings you joy and confidence. You are invited to discover an exclusive, private clinic where we are generous with our time – because we care. We adhere to the most stringent patient health and safety practices at Dermaworks. Our array of anti-aging and cosmetic enhancement treatments are evidence-based. As arguably the best medical clinic Ottawa has to offer, we focus on achieving real-world improvements to help you lead a happier, more confident life.